The Concordia men’s soccer team wrapped up their season with a 3-1 defeat to the Laval Rouge-et-Or on Sunday afternoon. The Stingers finished their season with a 3-9 record and finished in sixth place in the Réseau du sport étudiant Quebec conference standings. “Our expectations weren’t met up to the degree we were hoping for,” manager Greg Sutton said in terms of the season. Already out of playoff contention heading into Sunday’s game, the Stingers hoped to end the season on a two game winning streak after defeating Sherbrooke 2-1 on Friday. However, Laval forward Marc-Olivier Kouo Dibongue had other plans. The Cameroonian netted a hat trick for his team on Sunday and the six foot four striker will end the season as the winner of the RSEQ Golden Boot, given to the top conference goal scorer at season’s end. Dibongue scored seven goals in 10 games. “On a personal standpoint, it was one of my goals for this season. It’s my fourth year in the league, I’m a team leader, and my job is to score,” Dibongue said after the match. While it is an important achievement for the striker, Dibongue made it clear that his true aspirations lie elsewhere. “My main focus is on the semifinals versus UQAM. I’m confident in my team and I know we can beat them.” he said. 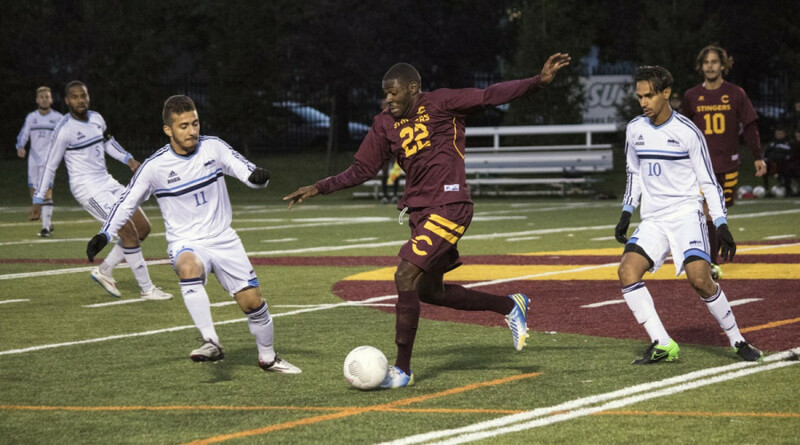 During Sunday’s game, Kouo Dibongue’s seventh minute goal was cancelled out by Concordia midfielder Roby Simard’s strike. In the 25th minute, Simard found the back of the net with a shot from just inside 30 yards from the goal, which saw the Stingers tie the score at one goal apiece, which would remain tied until halftime. “I was close on my first shot and so I wanted to test the goalkeeper again. Sure enough, I scored,” Simard said about his wonder goal. Stingers defender Mateo Zazo almost gave Concordia the lead in the second half with a volley shot for goal, but his effort was saved. Just seven minutes later, Kouo Dibongue would strike again with his second goal of the afternoon. His third goal in the 75th minute would put the game out of reach. All three goals were scored on breakaways. Prior to the match, Concordia honoured their one and only graduating senior, goalkeeper Remo Taraschi. “It was a unique opportunity that not many people get,” Taraschi said about his long career with the Stingers. Although the Stingers missed the playoffs yet again, they did show impressive signs of improvement. After going winless last year, the team managed three wins in 2015. They also scored four more goals, and tied the 2014 mark just four games into this season. Only losing Taraschi to graduation, the Stingers expect to return all the rest of their players to the field next season. They will hope to build together during the indoor winter season as well.